Jen Lee was born in Manhattan but grew up in a beach town in Florida. She started to draw and make stories, usually about animals, in elementary school. She used to record her favourite cartoons and replay them, pausing at her favourite scenes to tape paper over the screen and trace the stills. She went straight to the School of Visual Arts in NYC following high school to study for a BFA in illustration, taking classes in comics, graphic design and writing. Jen then moved out of NY to try and become an animal behaviourist but landed a job in graphic design and marketing with a software company. 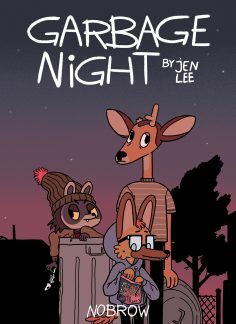 Since leaving that job Jen tried her hand at creating comics and uploaded them on to the internet and is now a freelance illustrator living and working in a farmhouse near Idaho for clients including Drop Dead Clothing, Burton, Boom! Studios and Nickelodeon. Her work has been exhibited by Telegraph Gallery, Spielsalon and at the Amakusa Cultural Exchange Center. 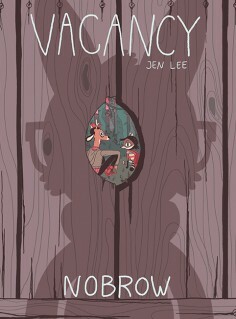 Vacancy for Nobrow is her first published book. Recurring themes in my work are animals, teens, abandonment and the supernatural. I love exploring the way animals think; how they may internalise their environment changing. Abandoned and destroyed areas (whether from nature or people) and the unknown that may stem from this can create a paranormal element. The colours of the concrete during Florida sunsets, hanging out in an abandoned airport with my childhood dog, driving around the neighbourhood early morning listening to Art Bell, staying up too late at too young an age watching really violent anime, Russian animation and music videos. Playing ‘Ecco the Dolphin’ the first time just expecting an dolphin simulator (your whole family gets taken away by spooky aliens). Artists that influence my work include Marc Boutavant, Dave Cooper and Andrei Tarkovsky. I guess I play out the imagery and story in my head like a music video. I want it to hit a certain mood, decide which moments I really want to show and really consider the pacing. Technical stuff I start with a characters goal in mind and work around that, creating an outline. They might meat the goal, or they might not, I play it by ear. I never write out a full script and go straight to the thumbnails, it’s a lot easierfor me to see if something is not working that way. Moving on to roughs and I will add in any dialogue if the action calls for it. Then the really fun part happens where I ink, decide on contrasts and pick a palette.